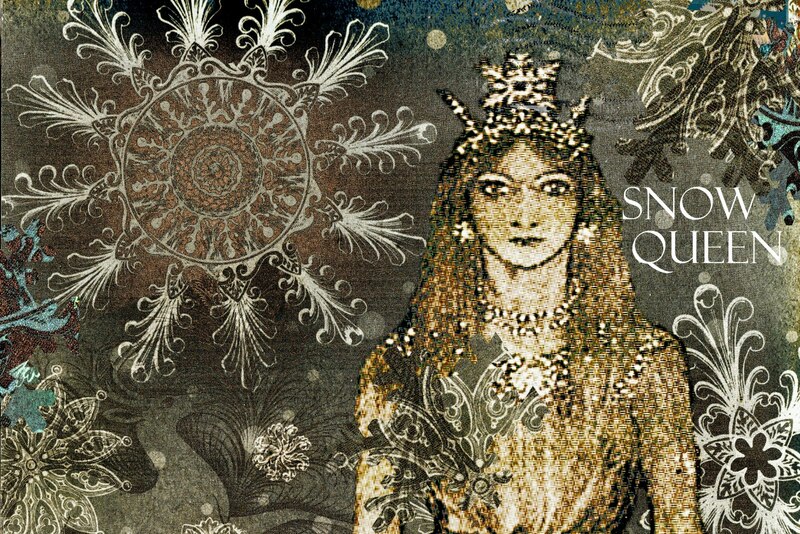 This is my 4x6 entry for the Sunday Postcard Art challenge with the theme"Let it Snow". 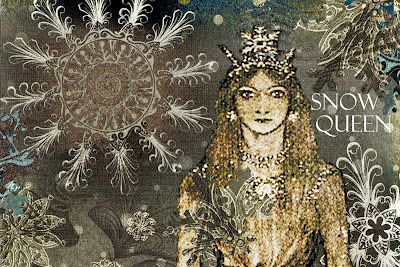 I overlayed an image (Dover) of Dulac's Snow Queen and cropped images of the deer and digital snowflakes from artist papers (K& Company). I then mixed 4 layers of artistic gradient filters for a quiet , cold effect of a wintry snowfall. This is my entry for Theme Thursday. 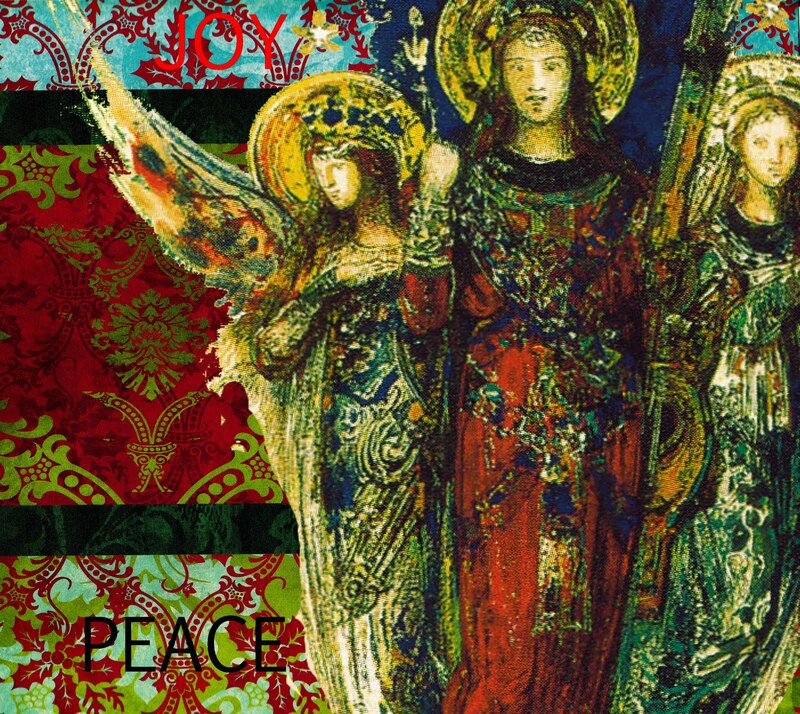 A digital Christmas card with image from Dover and decorative artist papers from Creative Imaginations. Multi layers and artistic filters added. This is my digital "Time" entry for The Three Muses challenge this week. 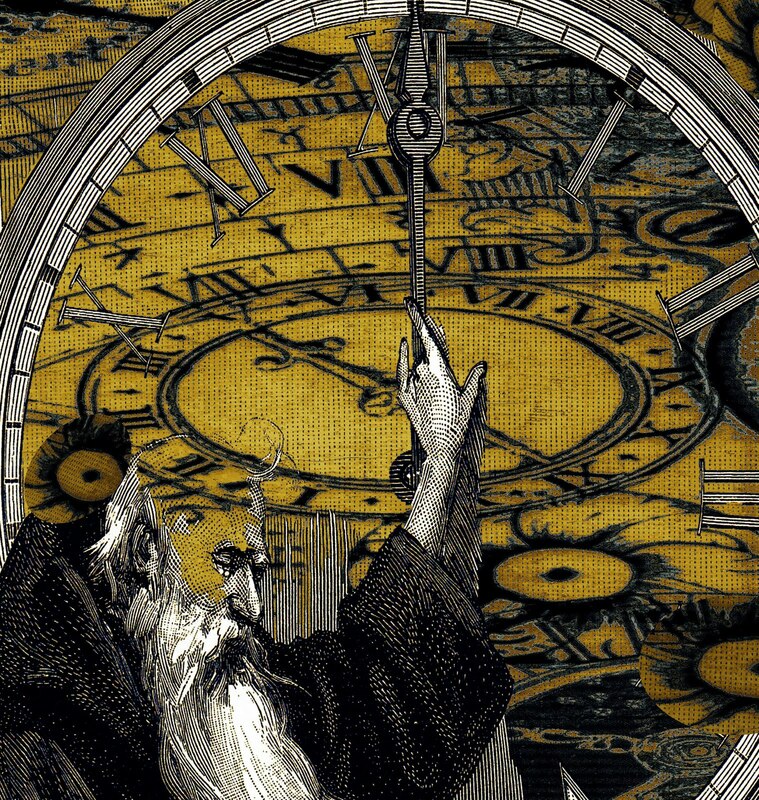 Time is a vast and many -sided theme ; almost too big to portray easily in an art entry. I have a real love/hate relationship with time. I need it to bring order and accomplishment to my life yet it can be so restrictive and stressful . It is always present , marching on , sometimes running behind and for sure running out! Learning to manage it, save it and keep it- is something I think we all try to balance while trying to proverbally live in the moment. My collage trys to represent time through age with wisdom , control and synchronisity. 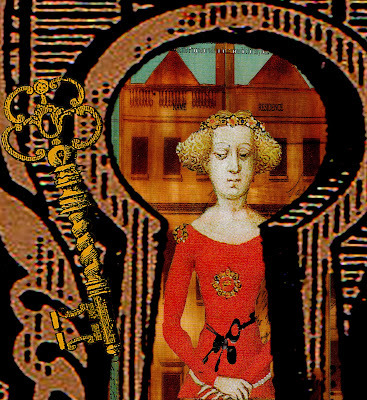 This is my entry for the Mixed Media Monday challenge "Playing Cards". I am slowly trying to create a fabric journal and this is a page that will be added to it someday. 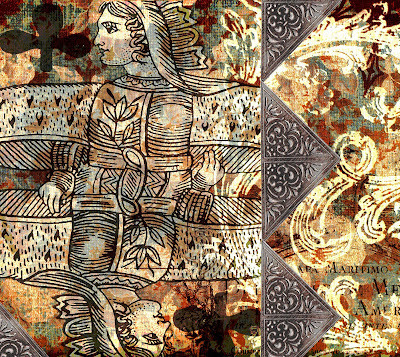 I took an image of an antique playing card and printed it onto opaque"printer" fabric. "Jacquard" makes a whole array of (paper- backed) fabric for your printer! I then layered it onto the background fabric (with spray adhesive) allowing the print and color to show through. Finally I added cut metallic pieces as decorative trim. This is my entry for the Theme Thursday Challenge where the prompt is to make a 3x5 colorful(skinny). I decided to make a small journal like page made from bits and scraps of paper, text and old scripture elements. Woman image is from Dover. Digital artistic filters are added. 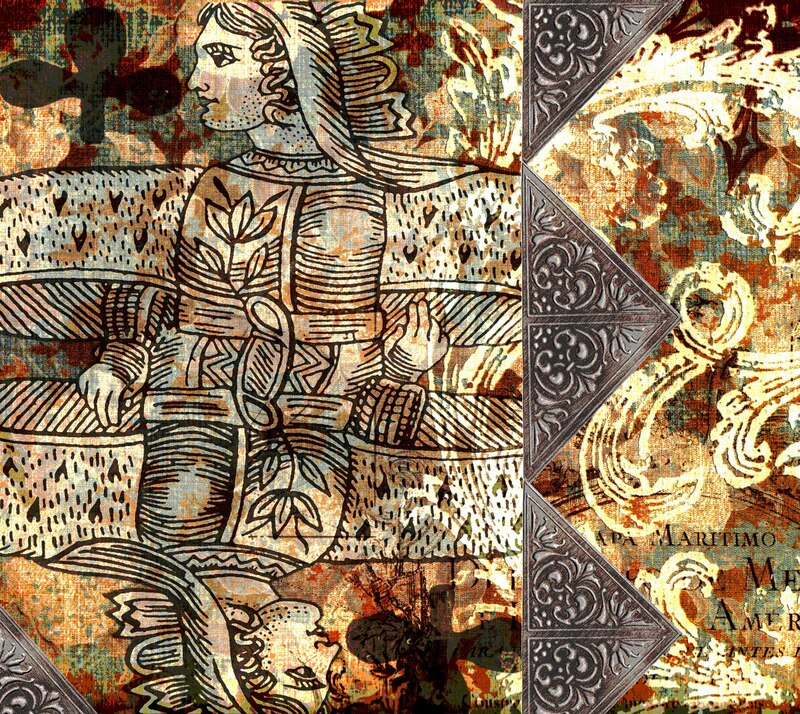 Background image from Character Constructions, woman image from Dover and key and lock from Lost Coast Designs, all cropped, layered and artistic filters added. 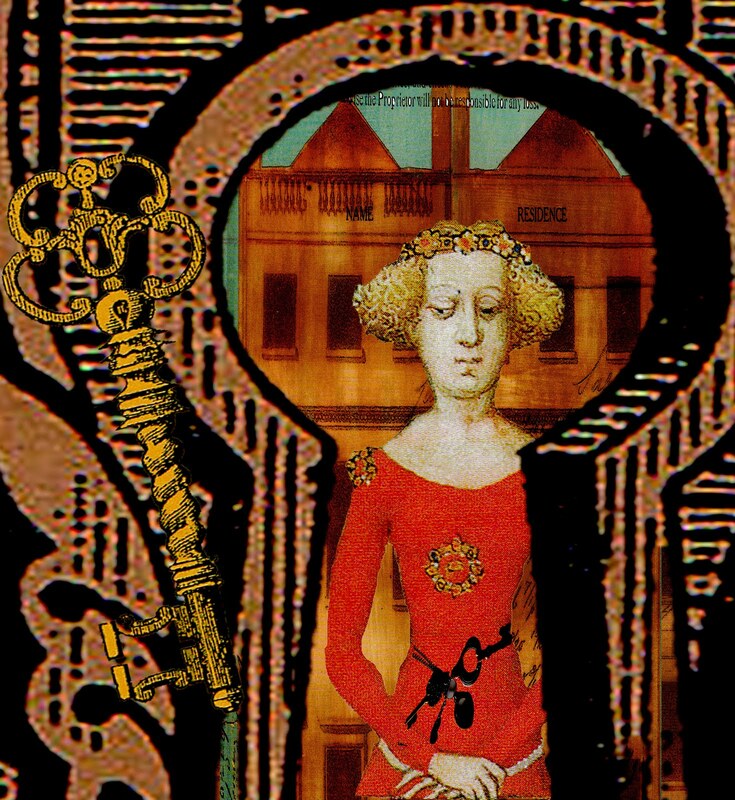 I added the keys around her waist from a personal photo. This is my 'Music' entry for the Sunday Postcard Art challenge this week. 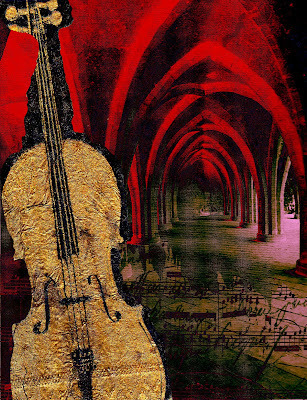 This is a digital 4x6 postcard made from a travel photo (wikimedia), sheet music clipping cropped and scanned and the cello image is from a paper napkin hand cut , cropped and digital artistic filters added. 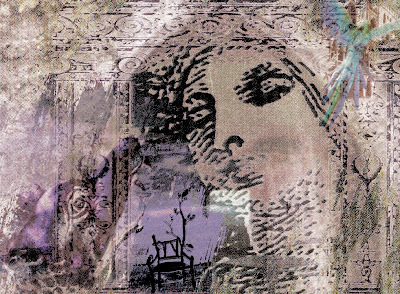 The theme at The Three Muses this week is 'Dreams' and this is my digital dreamscape. Dreams for me are very symbolic and in this piece I represented some recurring symbols in my own dreams (flight, fear- monster, portals and the appearance of non-sensical objects. I do dream in color but it is often muted or hazy with undefined edges. Dreaming is creative and uninhibited (a little like digital art) in the sense that you manipulate images to unrealistic proportions and meaning. Very cool but challenging theme this week! 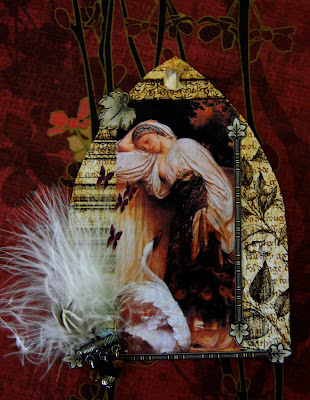 This is my entry for the Mixed Media Monday Challenge "Fashion". 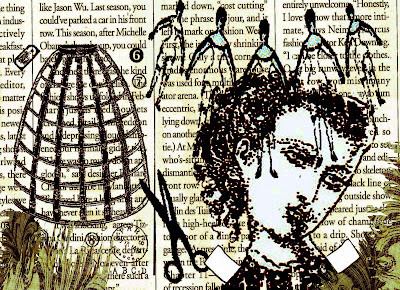 These are journal pages composed of fashion magazine articles, rubber stamping (Character Constructions) and some digital highlights added. Hand and digitally painted. This is my entry for the Sunday Postcard Art challenge this week where the theme is "crackle". 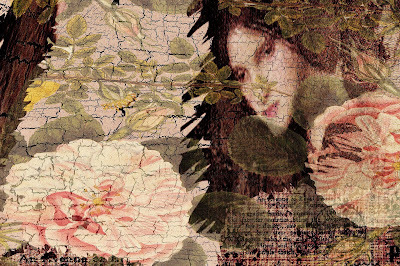 This is a digital collage and I began the layering with an old crackle artist paper as the background and cropped and overlayed rose images and the image of the woman's face (Dover) on top. 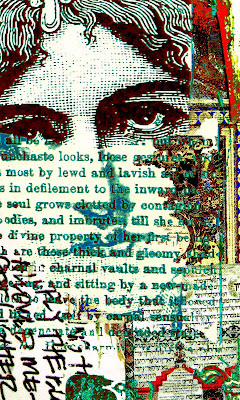 I added a postal stamp and text and reduced opacity enough to let the crackle through for the effect of an aging garden wall fresco. The crackle effect is very definative when the picture is enlarged. This is my entry for the SaWo challenge this week. 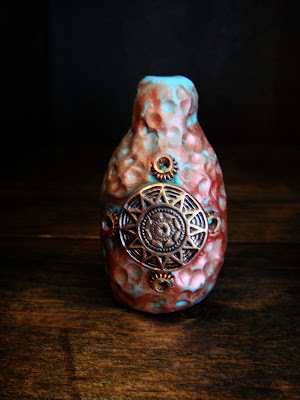 This is a nail polish bottle that was cleaned out and covered with turquoise colored Fimo clay . I gave the clay a hammered copper look by using the end of a nail punch. I baked the clay bottle in the oven (about 30 min.) and when completely cooled I painted with a copper metalic paint and added bead embellishments. The top is left open and can hold a tiny spray of dried flowers. This is my entry for the Three Muses challenge this week where the theme is couples or a pair (of friends) in this case. When I saw this image I was immediately taken back (more years than I want to count) to my Ballet days and remembered the special 'bond' that happens when young people are engaged in the same dreams and studies- both hoping for recognition. The similarities rather than the differences are the basis to the friendships and serve to support and help each other grow. 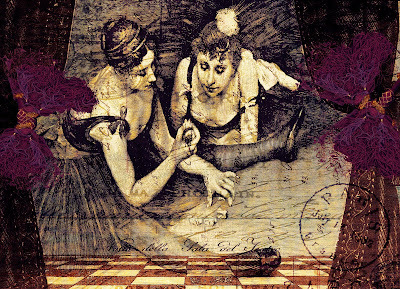 This is a digital collage made with artist papers (Character Constructions), Dover images, digital tassels and multilayers of artistic filters. This is my entry for the Gothic Arches challenge this week using an image from Lord Frederick Leighton -his "Odalisque" done in 1862. This is a handmade arch, embellished with feathers, beads and a few digital butterflies added!